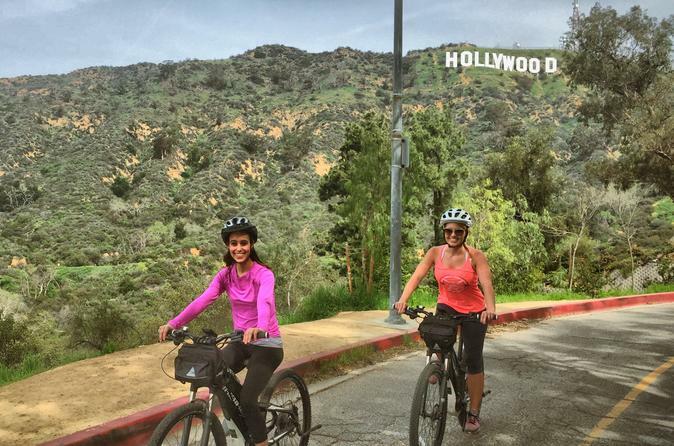 On the Hollywood Sign eBike Cruise you'll get away from the crowded city using a powerful electric bike. Ride on the back trails of LA's beautiful Hollywood Hills with your guide giving you an inside look at some of the history of the area. You'll love breezing by the hikers walking up to the top of the Hollywood Sign as you take in the San Gabriel Mountains in the distance. Discover the less explored parts of Los Angeles as you make your way to the most famous sites! Kids 15 and up can ride their own ebike. Spanish speaking guides available upon request. All tours start with an orientation of your personal electric bike, so you are sure to feel comfortable throughout the tour. You'll meet and train at our Hollywood shop. After grabbing waters and snacks, we'll take you straight into the Hollywood Hills and make the easy climb up to the iconic Sign for some killer selfies. Then we'll cruise up Mt Lee drive to get a view of the whole city, San Fernando Valley, and surrounding mountains. Finally, you'll come down from the mountains and ride through the Hollywood Hills and check out the unique real estate as you work our way back to our starting point. The bikes, helmets, and refreshments are brought to you, you just come ready for an epic ride!